"You're going to get in too deep, and they're never going to let you out." Sony has debuted the first official trailer for White Boy Rick, a true story drama starring Matthew McConaughey. This is the second film directed by French filmmaker Yann Demange, who made the outstanding Irish thriller '71 previously (which is worth a watch if you haven't seen it yet). The film is about a teenager who became an undercover informant for the FBI during the 1980s and was ultimately arrested for drug-trafficking and sentenced to life in prison. The cast includes Jennifer Jason Leigh, Rory Cochrane, Bel Powley, Eddie Marsan, Brian Tyree Henry, Bruce Dern, Piper Laurie, RJ Cyler, and Jonathan Majors. This actually looks better than expected, half because the 80's vibe, and half because Demange is a great director. Take a look. The story of teenager Richard Wershe Jr., who became an undercover informant for the FBI during the 1980s and was ultimately arrested for drug-trafficking and sentenced to life in prison. 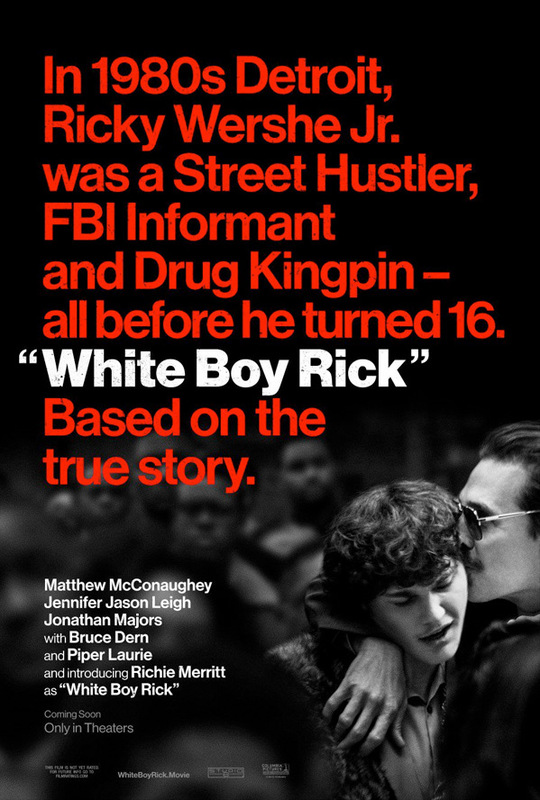 White Boy Rick is directed by up-and-coming French filmmaker Yann Demange, who directed acclaimed film '71 previously, as well as TV work. The screenplay is written by Andy Weiss & Logan Miller & Noah Miller, and Steve Kloves & Scott Silver. This has not premiered at any film festivals yet. Sony Pictures will release Demange's White Boy Rick in select theaters starting September 21st in the fall this year. First impression? Your thoughts?